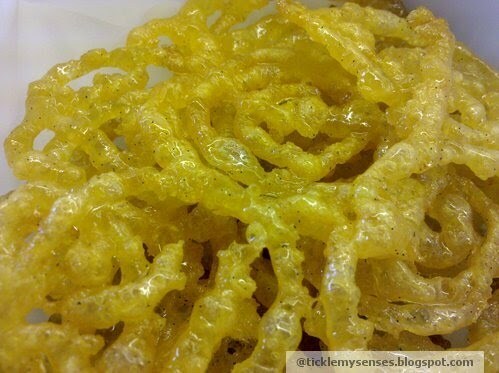 My best memories of these delicate, crispy, saffron flavoured sweet is during my shopping sprees on Commercial street in Bangalore. For those of us who cannot get our hands on the Bhagatrams jelebis, the recipe below produces crispy and tasty sweet jelebis, when the craving strikes. 1. Take a large bowl add curd and whisk well. 2. Sieve together maida and cornflour. Add to curd slowly, and mix well using a whisk to get a lump free mix. Add 2 tbsps hot oil and mix again. Add a pinch of golden yellow colouring if desired. The mixture should be of pouring consisitency and should flow in a continuous stream and not break when the batter is poured from a height. Add milk to get the right consisitency if needed. 3. In a small bowl take 3 tbsps warm water, add a tsp of sugar and dissolve. Add 3 tsps of fast acting yeast granules, mix well and allow to activate or foam in a corner. Once the yeast is activated add to the prepared batter. Cover bowl and keep aside in a warm corner to ferment and rise. The batter will appear risen and bubbly when fermented. May take 4-6 hours in summer. 4. For sugar syrup: Prepare an hour before frying jelebis. In a vessel take 3 cups sugar, add 1 and a half cup water , stir over a gentle heat till sugar is dissolved. Add 5 pods cardamom crushed and a few saffron strands for flavouring. Add a few drops of lemon juice to prevent crystalisation of sugar and then on medium heat continously heat the sugar syrup to get a single thread consistency. (will take around 20-30 mins). Once ready keep warm. 5. Heat oil in a large wok to fry jelebis on a medium high flame, take a squeezy sauce bottle and fill up with fermented batter. Pour the batter in a jelebi pattern into the hot oil fry on a very low flame till golden in colour. 6. Remove jelebis from the oil drain the oil, immediately dip in the warm sugar syrup for a min and remove to a plate. Hot crispy jelebis are ready. Serve hot. For added pleasure serve with vanilla ice cream.